Sat 3/30, 7 PM, Playground Theater, 3209 N. Halsted, theplaygroundtheater.com, $5 suggested donation. Comedian Kayla Pulley is tired of the open mike scene in Chicago. As a black woman, she doesn't always feel very welcome or even safe in the predominantly white, male environment. Even after years of proving herself on stages around the city, she would too often find herself walking into a room and being completely ignored by comedians she saw every day. She would call out the problems with open mikes in the city on stage to zero response. No one seemed to want to do the work of acknowledging performers of color. It got so bad that she quit doing stand-up. But then she decided she shouldn't have to leave the scene entirely. She and fellow comedians Asia Martin, Jillian Ebanks, and Lauren Walker, all black women, started something new in an attempt to create a supportive comedy environment. Lemonade Stand is a stand-up showcase and open mike specifically for women of color that takes place the last Saturday of every month at Playground Theater. "It's called Lemonade Stand because, as women of color, life continuously gives us lemons and we have to make lemonade with it," Pulley says. "And now we want to share this lemonade! We were like, there needs to be a place for us to feel comfortable doing this, because there are so many of us who would be so great at this, and there aren't safe spaces to do it." Each month features a showcase of four to five comedians who are already performing around the city and eight to ten mike slots for new comics. 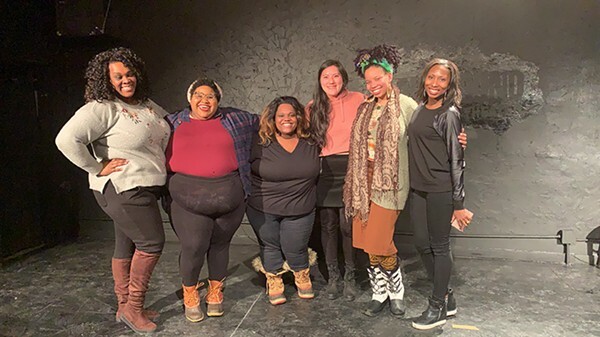 Since the show's debut in October, Pulley has already seen women who tried stand-up for the first time at her show performing at other places across the city. While this space was created to give women of color opportunities to perform, it's in no way exclusionary. Preference is given to women of color, but everyone is invited to sign up for the open mike and offer support from the audience. Pulley hopes what she and her cohosts are doing with Lemonade Stand can serve as a model for how other rooms are run. Everyone needs to come together to upend toxic open-mike culture, she says, and increase the diversity among performers on Chicago stages. Meredith Kachel, a comedian and now statistician, did a ten-month study and crunched the numbers. For many years, the stand-up comic struggled to be heard, but soon she’ll be impossible to ignore.